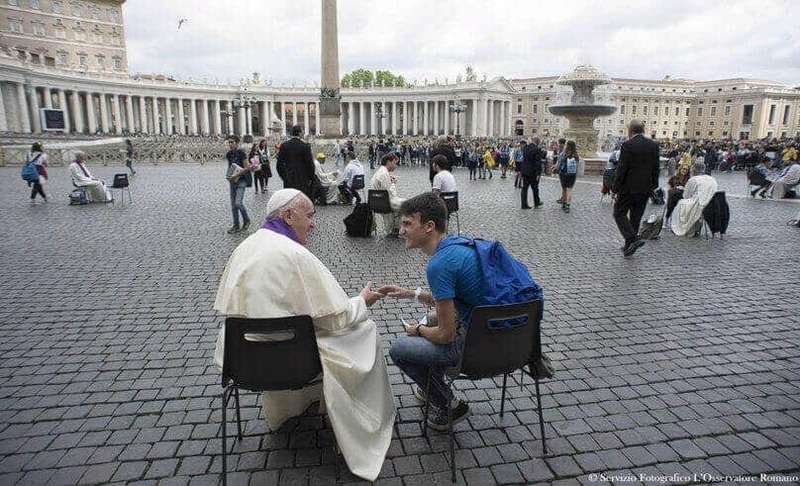 A former university chaplain tells the story of a young man who had recently returned to the Sacrament of Reconciliation after a long time away and had become something of a Confession evangelist. The priest was agog and quickly calculated how long it would take the youth to say 500 decades of the Rosary if the confessor gave his friend a penance like one rosary! When they caught up again the following week, the chaplain asked how it had gone with his penitent-friend and himself. The young man joyfully announced that he was doing 100 times the penance received. Intrigued, he asked only 100. “Because,” he said with a smile, “the offer of 500 was only valid for the weekend. But my mate finally went to Confession today.” When he asked him what the penance was, the lad answered with some relief, “an act of thanksgiving”. This story highlights both the great relief experienced through Confession, especially after a long time away, and the resulting eagerness some have to share that liberation with others. Today that joy and enthusiasm are experienced by too few, as the long queues we used to see of people waiting for confession are rarely found. We could give many reasons for this: our healthy correction of the low self-esteem, fear of God and overuse of the sacrament found in bygone ages; the bad experiences some have had in the confessional; modernity’s loss of a sense of sin and under-appreciation of the need for salvation; and so on. Some argue we should reform the whole sacramental system: they say the decline in individual “First Rite” confessions and communal “Second Rite” preparation and thanksgiving for private confession means we should offer “Third Rite” general absolution as the way back. But it seems to me that most of those who have abandoned first and second rite Confession are not looking for Third Rite absolution from a priest either: they have long ago opted for “Fourth Rite” or self-absolution. I wonder if what is at issue here is really the confidence, perhaps over-confidence, even false sense of security, that we modern believers have about the mercy of God. So sure are we that we’ve done nothing very bad and that God will forgive us that we don’t feel the need to confess. In any case, we know the confessional is there if we do commit any real doozies – though what we count as doozies keeps changing, so that they are mostly things other people do. Ironically, then, it’s the easiness rather than the hardness of confession that keeps us away. Yet Christianity offers us something that self-help books, the culture of consumerism and other spiritualities cannot: a real chance to leave behind our past sins and present regrets and make a better future. Our readings today are all about this. King David, who put Uriah in harm’s way in order to steal his wife Bathsheba, repents after his uni mate Nathan exhorts him to return to the Lord (2 Sam 12:7-13). That great sinner, St Paul, murderer of Christians and persecutor of Jesus, joyfully boasts of the forgiveness and new life he has found in Christ (Gal 2:16-21). And a woman, coyly described as “having a bad name in the town”, is forgiven her many sins after she demonstrates her loving repentance and repenting love through anointing Jesus’ feet (Lk 7:36–8:3). Of course, few of us have organised someone’s death so as to steal his wife or get rid of his religion; we haven’t even done things that warrant having a bad name in Sydney. The point of the Scriptural stories is not that only really bad sinners need repent and seek forgiveness: rather, it is that if even they can be forgiven then those of us with more mediocre sins would find it all the easier to approach divine mercy. Repent, He says to us still: Don’t just feel bad – change. Don’t go on a guilt trip – head towards the sacrament of liberation. Repent and believe the Good News that I’m here for you, as I was for David, Paul and the woman of ill repute. Some people worry that they are too sinful to come to church, even to confession; they are like those women who clean the house before the paid cleaner comes. When as a bishop St John Paul used go to the closest church and joined the confession queue with everyone else, it was not because he thought he was uniquely good or uniquely bad. He just knew he was human and so he needed this. And priest-confessors, he knew, are sinners, too; they need confession themselves; they are not there to wag fingers or make heavy burdens for people’s backs; their job is to free the penitent. So people shouldn’t be embarrassed to tell their story to a priest. We’ve probably heard it before, no matter how original you think your sin is. What follows after repentance and absolution, then, may be a deep sense of relief. It may be a tiny glimmer of hope that things can change. It may be the experience of being strengthened for doing so by “sanctifying grace”, that is, Christ living in us. So we may be joyful and want to share this with others. Pope Francis proclaimed this a Year of Mercy precisely so that we would, among other things, rediscover the Sacrament of Reconciliation; rediscover our need and the God of infinite love who wants to supply that need; rediscover that the other great treasure of the Church alongside the Eucharist is ‘second baptism’, the recovery of our baptismal innocence through penance. This is the edited text of the homily preached by Archbishop Anthony Fisher OP at St Mary’s Cathedral on Sunday, 12 June. Archbishop Anthony Fisher OP is the ninth Archbishop of Sydney. He practised law before joining the Dominicans, and is one of the world's leading bioethicists.